Amtrak Absurdities. And David Bowie. I’m not going to make an argument for train travel in the US. Even a contrarian like me knows that’s a hopeless case. But I’ve been reading about trains lately and have amassed a bunch of fragments that I’ll stuff into this virtual cabinet of curiosities in case someone else can use them. We could drive. It’s 718 miles and would take 12 hours. Fuel costs for a 2008 Corolla: $52. We could fly. Here’s a fare for $167. Flight time: 1 hr, 43 min. Or we could take Amtrak. Cost is $245 one way, and we’d be there in only 37 hours, 41 minutes. I am not kidding. Major Population Centers (# ranked) in the US not served by any passenger trains. As car ownership and the Interstates grew, passenger rail travel options decreased. 85% fewer passenger cars operated in 1965 than in 1929. When Amtrak was established in May 1971, all but 182 of the 364 passenger trains that operated on April 30, 1971 were discontinued. Now it operates 44 routes. The first gas shortage in 1977 could have seen a return to passenger rail. Instead, the number of routes continued its decline. So much for energy conservation political posturing then — or now. Having roadways doesn’t mean you can’t also have passenger trains. The rails are in place in the US: why aren’t they used for people as well as freight? If Americans don’t want to use public transportation, why do they fly? If supporting a national rail system is socialism, wouldn’t the same be true of supporting an interstate highway system (arguably the largest Big Government Federal social engineering event in US history). 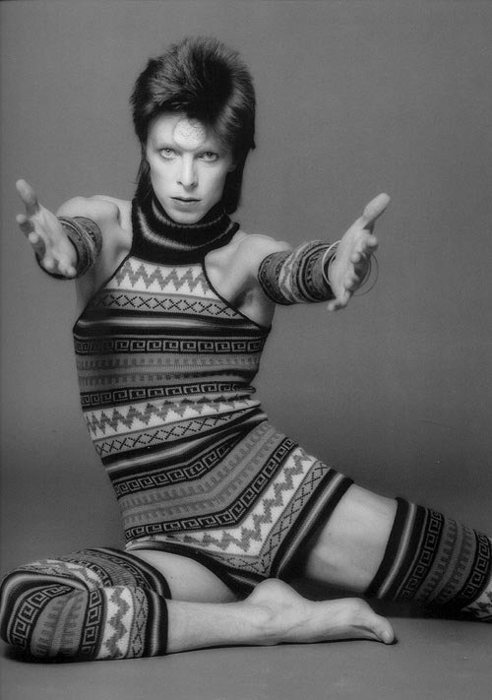 ”] Between 1972 and 1976, David Bowie toured the US five times. He didn’t fly a single mile, and in fact, took ocean liners across the Atlantic. In the US, he used buses — and Amtrak. He made multiple trips on the Super Chief (aka Southwest Limited) between LA and Chicago. He rode the Floridian, which ran from Chicago through Louisville KY, Nashville TN, Birmingham AL, Jacksonville FL, and down to Miami (and points in between), which was shut down in October 1979. He took the Coast Starlight from Seattle to LA, and the Sunset Limited for Phoenix. This is a trip he couldn’t take today. And others. Too bad no one was paying attention. Would passenger train travel be different today if someone had?